Typically, school gardens involve students in hands-on science learning as they observe the whole plant lifecycle and explore how the environment affects the growth and health of plants. And then there is the food connection: Students realize that fresh fruit and vegetables don’t originate in the grocery store, and begin to appreciate how delicious and nutritious fresh food is. And sometimes have a chance to delve into the sustainable agricultural aspects of food production. In many schools, gardens have jumpstarted changes in school lunch so that students are eating fewer processed foods, and in events like Garden to School Café, eating meals prepared with produce right from their school gardens. Don’t forget environmental awareness and stewardship: Maintaining a garden helps students understand the importance of a clean, healthy environment. Establishing a school garden has some basic steps: school/administrative/custodial OK; a group of committed parents and teachers; an outside space (and don’t despair if it’s just concrete or has minimal shade…it’s doable! ), access to water; substantial first-year planning and physical work; some financial and other resources; and PASSION AND COMMITMENT. It might take a year or two to make gardening a smooth operation – so do think big, but start small. 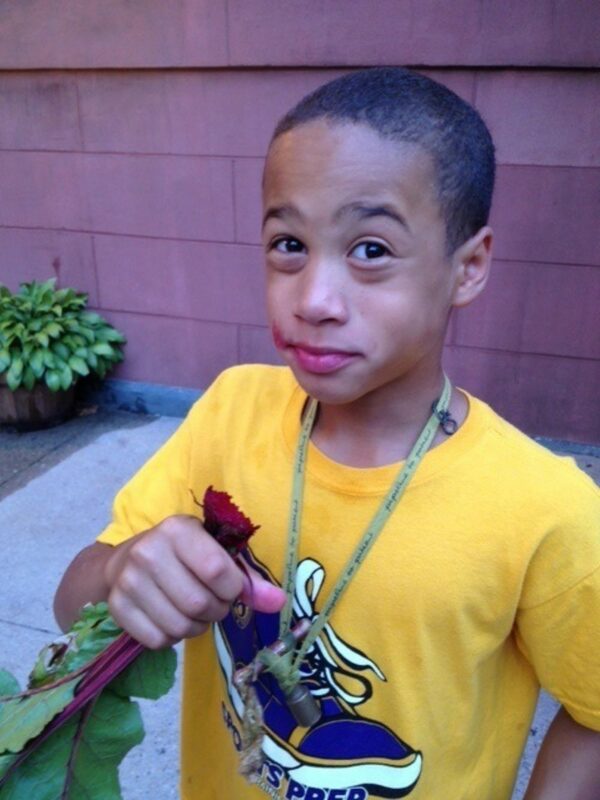 There are myriad school garden resources in the city…and many school gardens that can serve as models. The school gardening community is quite tight knit and people are willing to help every step of the way. The best part? No matter what challenge you might face, you know the garden is amazing every time a child plants a seed, plays in the soil, finds a worm, eats a vegetable he or she has not eaten before…and those are the experiences you want, no matter the garden size or location. Think of school gardens this way: Have garden, make change…that is long lasting. There are so many benefits to school gardens, and they roll out differently in each school, depending on envisioned use and impact. Ask the principal whether a school garden can be established, and if it’s a yes, then ask him or her where the garden can be located, how big it should be, etc. Determine the best garden location. Work with the custodian, make sure there is access to water, and take into account any regulations/requirements that must be followed (fire safety, security, etc.) If the garden is in a gated area, make sure you have a key (this can be tricky depending on your custodian and overall school culture). Visit other school and community gardens to get a feel for what might work at your school (there are lots of good models, including those featured on growtolearn.org). Establish a garden committee (parents, teachers, students, and other volunteers, like community gardeners or a garden-focused non-profit, etc.) IMPORTANT: Garden committee chairs need to be committed, engaged, creative, persistent, especially when getting the garden started. There needs to be at least one dedicated teacher. Continually think to the future: Who will run the garden down the line? How will it be sustained over the long term? Determine what type of garden you want. (Remember, the principal has the first call on this, though you can certainly negotiate, but the goal is to develop partnerships with school leaders and staff.) Create a garden plan (usually a visual map — make sure to think about storage and whether you want raised beds); you will want to show this to the principal and custodians for review and approval. If necessary, test the soil. If you are thinking about a gardening on existing green space, make sure to test the soil. Many schools green spaces have contaminated soil. For edible gardens, that is problematic, and that means building raised planters with new soil. Decide who will construct the garden (parents, teachers, and students? community volunteers? ), or whether you will raise enough resources for a pre-fabricated system. The latter is probably easier, but typically more expensive. The former is much more engaging and pulls community together…and can be quite fun. Consider a “gardening 101” for key volunteers and teachers. Have a garden launch: Announce it to the school, maybe a groundbreaking. Get some press! Create a plan for using the garden. REMEMBER: Start small. Maybe just a few classes to start. Determine how you will work with teachers in these classrooms…and what you hope students will learn. Teachers especially like to build gardening into aspects of the curriculum, like science. Have fun…anticipate challenges (everything from natural to school-based)…work through the challenges…grow incrementally.